Paris St-Germain's Yohan Cabaye believes a recent league defeat by Lyon may prove extra incentive in Saturday's French League Cup final. 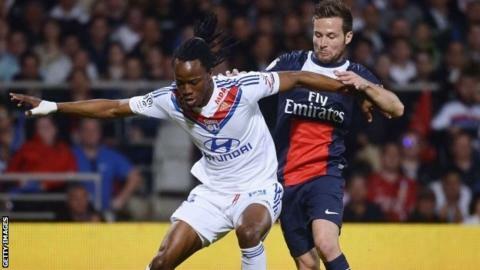 Lyon beat the runaway league leaders 1-0 last Sunday and the teams meet again at the Stade de France this weekend. "We have the chance to play for silverware. Our players will be ready and very determined," said former Newcastle player Cabaye. "We all want to win and perhaps the defeat will give us extra motivation." PSG, who will lift the trophy a record fourth time if they win, are 10 points clear of Monaco in Ligue 1, but were knocked out of the Champions League quarter-finals by Chelsea. They lost to Montpellier in the French Cup last-16 back in January. France international Cabaye said: "The World Cup is just around the corner, so we're all thinking about it a bit more than we were a few weeks ago. "But we still have important business to take care of in the league and there's a Coupe de la Ligue to win on Saturday, and it would be stupid to ruin everything now. "First things first, once we've got the league stitched up and a winning final out of the way, we can start to focus on the World Cup a bit more."